MARE NOSTRUM's biggest surprise isn't its instrumentation -- a trio of accordion, trumpet and piano -- but how natural the combination sounds in its execution. Of course, Italian trumpeter Paolo Fresu, French accordion player Richard Galliano (who is of Italian offspring), and Swedish pianist Jan Lundgren are well-known, critically praised jazz musicians who have all been known to eschew musical boundaries and defy genre limitations, so the music on MARE NOSTRUM -- an album co-led by all three -- shouldn't come as a surprise, nor should its quality, and yet not everybody would have expected such marvelous results. The 15 compositions on the album include originals by all three musicians and several covers, touching upon jazz, tango, classical music, and folk, reinterpreting Charles Trénet ("Que Reste-T-Il de Nos Amours? "), encompassing Antonio Carlos Jobim ("Eu Nao Existo Sem Voce"), and Maurice Ravel ("Ma Mère L'Oye"). There is an almost delightful sense of trust and ease among the three performers, who never take away their bandmates' spotlights, and who find a balance between playfulness and restraint throughout the album. The music is evocative, as if it was the soundtrack to a missing Louis Malle movie, and much of it creates a warm feeling of gentle nostalgia, even on the more up-tempo tracks. 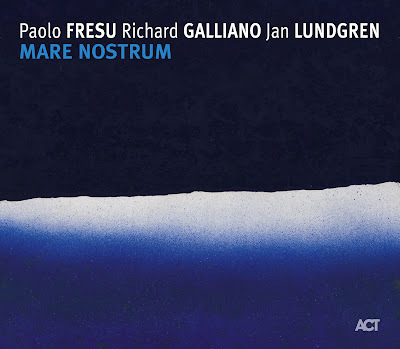 Let's hope these musicians meet again to record more music -- MARE NOSTRUM is a precious gem. This review was written for the All-Music Guide on January 23, 2008.